NIU took a chance on Isabel Contreras. It paid off. A caring and compassionate girl from a very young age, Contreras knew she wanted to be a nurse. Her high school grades were very good, but she wasn’t sure if she could make it into NIU’s competitive nursing program. She applied anyway and was accepted through our CHANCE program. Once she was in, there was no stopping her. Even when it was suggested that she have a Plan B just in case the nursing program was too much for her–she was undaunted. She was determined to prove to herself she could do it. 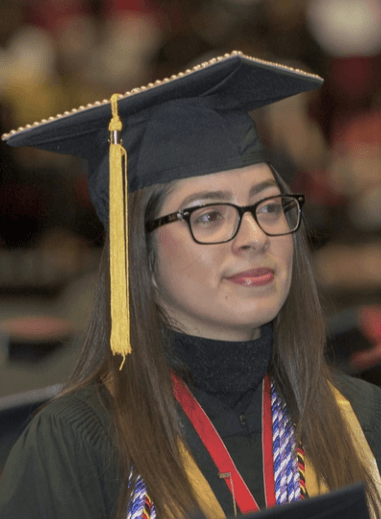 It’s a determination she learned from her parents, immigrants who struggled to make a life for themselves in the U.S. – with very little education–all while still supporting their families back in Mexico. Her father always stressed the importance of education. Contreras was not about to let him down. Not only did she get into the nursing program, she became one of its top students. She got involved with Research Rookies and set out on a big project: breastfeeding education for new moms. She, along with her mentor along with her mentor, Professor Donna Plonczynski developed a program to dispel myths and negative attitudes about breastfeeding and the DeKalb County Health Department agreed to let her test it out. A post-program survey revealed new mothers’ attitudes changed dramatically to the positive. The health department adopted her parts of her program on a permanent basis. The program’s excellent results have led her to present a poster at several national conferences. A role model to her peers, she will be missed by her professors and fellow students alike. But she’s off to great things. Northwestern Lake County Hospital is taking a chance on her now. She will begin their honors residency program next month, with the hopes of becoming a labor and delivery nurse.